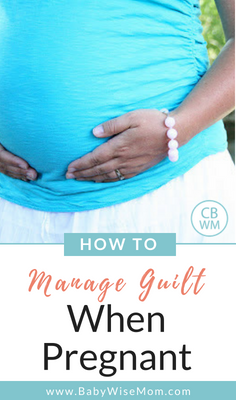 How to Overcome Mom Guilt When Pregnant. Tips for accepting life as is when you are pregnant and have other children to take care of and not taking on more than you can. A couple of weeks ago, as bedtime approached, I was far spent. My energy was zapped. I had done a lot of work that day. It was a hot day and my body temperature was elevated and my feet were swollen. I walked into the family room and plopped myself down on a couch all by myself as we gathered for family scripture study. I put my feet up to help with the swelling and took a nice sigh of relief. I was sitting, feet up, and ready to relax. All three of my children hopped up from their spots to come squeeze themselves by me. “I just want to sit by myself tonight,” I told my children. Brayden (7) and Kaitlyn (5) were visibly disappointed and McKenna (3) started to cry. I of course immediately felt guilty and wanted to retract the statement. My husband insisted the children sit on the other couch. I couldn’t shake the guilt, and since that night, no matter how tired, swollen, or hot I have been, I have surrounded myself with all three children each night. It struck me how much guilt a pregnant mother experiences! I remember back when I was pregnant with Kaitlyn. 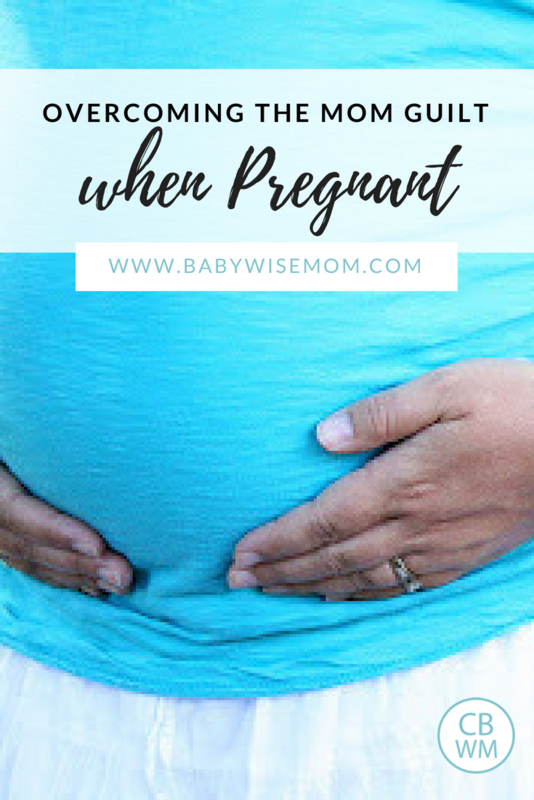 I had many of the same worries and guilt that I know most moms have while pregnant with a second child. I remember pangs of guilt as I watched Brayden eagerly walking hand in hand with my husband to play after he got home from work. I knew I was so sick and tired and not able to play like I had before I was pregnant. I remember worrying about adding a child to our family and taking time away from what I spent with Brayden. I worried I wouldn’t love my second baby as much as I loved Brayden. I felt guilty that I had cut our one-on-one time in life short. These are all normal feelings and worries. I think most if not all of us go through it. When I was pregnant with McKenna, I didn’t worry about the time she would take from the other children. I had long see the great benefits of a sibling and I knew adding a sibling to our family was a great gift to my children. I really didn’t often feel guilt during the pregnancy, either. It was right after McKenna was born that I came out of my pregnant fog and felt that incredible guilt as I looked back on the last nine months of my children’s lives. I thought of the hikes my husband had taken my children on the Fall before. I had watched him take the children with great relief. As I looked back on the things I had missed out on, I felt sadness and guilt that I had missed out on that. When I got pregnant with my current baby, I was determined to not miss out on anything this time. I have worked hard to keep our lives “normal” throughout. I often push myself further than is comfortable. I tried meds for my nausea until I got one that did not make me drowsy. I know I am trying to avoid that guilt I felt after McKenna was born–time will tell if I am successful. Even with my efforts, I feel guilty. I feel guilty that I can’t be as active as my usual self. I feel guilty that I don’t sew as many things for my children. I feel guilty if I fell asleep before story time the night before and didn’t get to read to a child before bed. I feel guilty that my lap is essentially gone; McKenna so desperately wants to cuddle up in it. After our children were in bed that night, I expressed my guilt to my husband. He had some words for me that I think are sound and make perfect logical sense. They don’t eradicate the guilt–I don’t know what could–but it helps me to try to keep things in perspective. My husband pointed out that life is full of sacrifice. Sacrifice is a great thing for us to do to grow. For our family, pregnancy is a sacrifice for the entire family. We all have our difficulties associated with it. The sacrifice, he pointed out, helps us to appreciate the end gift even more. That end gift is our new baby. The most significant things in life require sacrifice, and a baby is no different. He also assured me it is not a bad thing for children to have to give up things they want for something greater–in fact it is a great thing. Children should learn sacrifice and compromise. I try to remember these words as the guilt starts to creep up on me. My children, in reality, don’t seem to suffer any negative effects from me having been pregnant in the past. They should be able to survive this one, also. They are all thrilled and excited to have a new sister–I have never heard a complaining word that would indicate they wish I was not pregnant. Pregnancy might slow me down, but it does end with a fabulous addition to our family to enjoy for years to come! I just wanted to say thank you. This was just what I needed to hear being 7.5 months pregnant with two active little boys that want to play and run, and I just want to sit or nap. The guilt is very hard to deal with some days, especially as the end gets nearer and the discomfort is greater. But the end result will be a blessing! I needed this today, too. I am 21 weeks with a 22 month old little boy at home. I have suffered with sciatica my entire adult life, and being pregnant, it is even worse. I can hardly bend to pick him up and there are days where I can hardly do more than walk a few feet without pain. I know this next little boy will be a wonderful blessing and addition to our family, but some days, the "mommy guilt" gets to me! Thank you! Just what I needed to read. Expecting my second and the guilt has creeped in along with all the questions you mentioned. Good to know it is normal! I feel like this every day right now – being 11 weeks along, I've been at my least functional for the last 2 months! And I feel terrible that once again, next summer will be "wasted" for my oldest son, who I feel has been through too many boring summers of either having a newborn sibling or a sick Mommy! !But you're right, he's never complained about that. Now that he's 4.5yo, he understands there's a "baby growing in Mommy's tummy." He LOVES this, invites everyone to "feel right here on Mommy's tummy" everywhere we go to feel the baby (which of course isn't kicking or anything yet – he's going to LOVE that! ), and was announcing to his friends "When Mommy and my sister and me get more energy, we're going to the zoo!" after I told him that I'd take him and his sister to the zoo in a few weeks when I get some more energy. 🙂 He's just excited that at some point we're going to go.Thanks for this post. I feel these things so often! I can't read to my kids right now because it makes me too nauseated to read books, and that makes me feel guilty too! Such a true and honest sentiment. After I had my second, my first commented,"You can run with me again." I felt so guilty, but then realized she was just happy to have me running with her again and nothing more. Also, a friend who is the oldest of five once said that she remembers no bad feelings associated with others coming along. She remembers nothing but joy that there was a new baby each time. It seems to me that if you have more than one kid you will be battling this guilt constantly. Might be best just to realize that God gives our children just as much grace as anyone to get through their situations in life too! I agree with Jill. My husband is the oldest of 5, and has absolutely nothing but positive memories. He remembers more his mom's responses to them (ie, the times she'd get frustrated) but not the things that he couldn't do because of her pregnancy or the new baby. For whatever it's worth, it sounds as though you're a better mother while you're pregnant than I am all of the time, pregnant or not. I don't know how to sew, have never, ever taken a hike with my kids, and we only "study" the scriptures when I read to Olive from the illustrated book of Mormon sometimes before she goes to sleep. Valerie, you're doing incredibly well, by anyone's standards. I cannot express how lucky I believe all of your children are to have been born to you. oh Val this is just what i needed and yes so reassuring in a way to know even you feel this guilt! as you know I am wretchedly sick right now w this pregnancy – 95% of my time is spent in bed and i can do almost literally nothing for my kids. when i was getting some alternate health treatment before this pregnancy (in the hopes of avoiding this sickness!) she said she could sense i was carrying grief related to my pregnancy which is the grief i felt last time (and again this time) in not being able to parent while i was pregnant as i was so incapacitated. there is a lot of letting go. and yet – children are resiliant and i love what your DH said – obviously having a baby is for some families a labour of love and sacrifice for the whole family!! my DD4 sometimes cries bc she wants me to feel better again but i know she will be fine in the long run and this baby will be worth it! This is just so beautifully put, it made me tear up! Guilt is on the looooong list of things I *wish* somebody had told me I would experience in mommyhood. It's great to hear such an honest perspective! I especially loved your Breastfeeding Hurts post for this same reason! This brought tears to my eyes. I'm not yet pregnant with my second, but these thoughts have frightened me for when I do get pregnant. Thank you for the post-and thank your hubby for the wisdom! I would love to know more about what you do with your children for family scripture study. When did you start? How do you accomodate their ages? Do you use a specific author or through-the-year guide? You are all welcome everyone! Thanks for sharing your own comments here! It is great to hear from you. Katie I was totally that way this pregnancy–unable to read aloud for a while. I couldn't even pray aloud for a long prayer without throwing up! So crazy. It did go away. I hope that does for you, too. Jill I love your comment. I think you are right–there is always something we could feel guilty about with more than one child. And I agree that they have the capacity to handle it all if we let them. Aleasha,I can't remember exactly when we started every single night and the way we do it now. It has been at least three years as we do it now. I will say I think we should have started the habit from birth with Brayden. It isn't a regret–we did the best with what we knew and thought, but I think it would have been wise to start at the beginning.We do it each evening before we read bedtime stories. It is part of the bedtime routine. I think picking a time of day is essential–I don't think what time matters so long as it is a time you know will be available each day of the week.We start by reading from picture book scripture stories that are published by our church (Church of Jesus Christ of Latter Day Saints). They are summaries of scripture stories that are illustrated.We then read straight from the actual scriptures. I think this is very important–I want my children to understand scriptural language (we are King James Version readers so it is very proper and different from the English we speak daily). We first read one column. We currently read one page a night. The children are required to sit still and be quiet and listen.We have Brayden read some. He usually reads a column at this point. When he started, he read one verse at a time. Kaitlyn reads one verse (but with great help). McKenna repeats what one of us whispers in her ear. She does one verse. When we first started, Brayden commented that the language was very weird and he couldn't understand it, but he quickly understood what was being said. They know the scripture stories well (Daniel and the Lion's Den and such) and can repeat many of them better than I could. They are also learning to understand and read scriptural language. They ask questions when they have them (last night lead to a discussion on Resurrection). Very valuable!